2. How long does it take to make? Because Engineer is included in that generic everyone, I do have to justify homemade vs. store bought. For some things I do actually buy and prefer store bought cleaners. For the most part, we go all natural frugal homemade recipes for cleaners. I like natural and I like inexpensive but I do NOT like black grout so I buy some nasty stuff to take care of the situation and we evacuate the building. I am not ashamed...mainly because I do not have black grout. 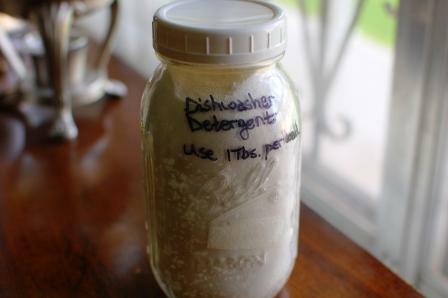 That being said, here is a detergent that is cheaper, super quick to make, and works well for us - homemade dishwasher detergent. You may find that you need to tweak the ratio of the ingredients due to the hardness of your water. Oh, and don't forget to add vinegar as your rinse aid. *Warning* Do not use this detergent when washing sterling in the dishwasher or any metallic rimmed dishes or glasses. The citric acid will discolor them. Mix everything together and put in a jar. Shake before each use. If it begins to clump together, just use a spoon to break it up. To use put 1 Tbs. of mixture in the detergent holder, receptacle, pocket, storage facility, holding bay, what do you call that thing? *I have also used 2 Tbs. citric acid instead of the Kool-Aid and that works as well. How long does it take to make? About 1 minute, 3 if you don't have everything handy. I'm with you on the black grout :)! This isn't a homemade cleaner I've seen before, and I'm excited to give it a go. I really like your canning jar storage, too! Thank you for the encouragement to try making it at home! !